One of the necessary cleaning steps for spring cleaning in a pond is to remove muck from the bottom. This layer of sediment is made up of decaying organic matter that has sunk to the bottom of the pond. If the muck becomes too deep, it can start leeching oxygen out of the water in your pond, which is harmful to both fish and plants. Place a child's pool (inflatable or rigid doesn't matter) next to your pond. Situate it in a shady area. Take a bucket and fill up the pool with water from the pond. Use a net to catch any fish in the pond. 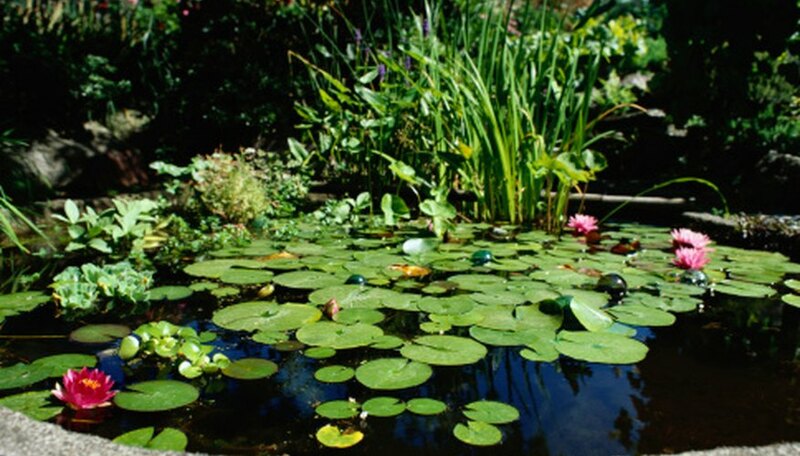 Take any aquatic plants and place them into the pond. Drain the pond. You can do this by siphoning the water out by hand with a hand pump or by running the supply hose on your pond pump out and into your yard. Don't let the level of the water inside the pond drop below the pump. Drain out the last bit of water by hand. Remove any large objects from the bottom of the pond, such as rocks or logs. Scrape up as much muck as you can with a hand shovel or other tool. Take care not to scratch the pond liner as you are working. Carry the muck out of the pond in a bucket and dispose of it in your yard. Attach a sprayer to the garden hose. Spray down the sides of the pond. Vacuum up any water and muck still in the bottom of the pond with a shop vac. Continue spraying down the sides of the pond and vacuuming up the debris until the pond is clean. Replace any filters and pumps. Refill the pond. Add any aquatic plants. Add water treatment as needed. Turn on the pumps. Replace the fish in the pond.